Falling asleep the night before the Star Wars 10K was impossible. I blame Sir Elton John. My Friday went from the Star Wars 5K to the Lilly Belle to Club 33 to watching Sir Elton John perform live in front of Sleeping Beauty Castle. Seriously. It was like a dream and I was too excited to sleep. I STILL have goosebumps! This 10K would be my longest distance traveled since my stress fracture in November, so I kept my race kit simple. All black with a REBEL hat. ASICS capris, Saucony on the feet, Champion tank, Garmin Forerunner 230. I was excited about the course because we would be spending very little time off-property. Just like the 5K the day before, the first character stop was backstage. This time it was Boba Fett. Boba had a long line really early on. I know to stay away from bounty hunters - so I breezed on by. What if Boba Fett is really a lady? Running in, near, through and around Sleeping Beauty Castle never gets old! I stopped for a photo without hesitation. 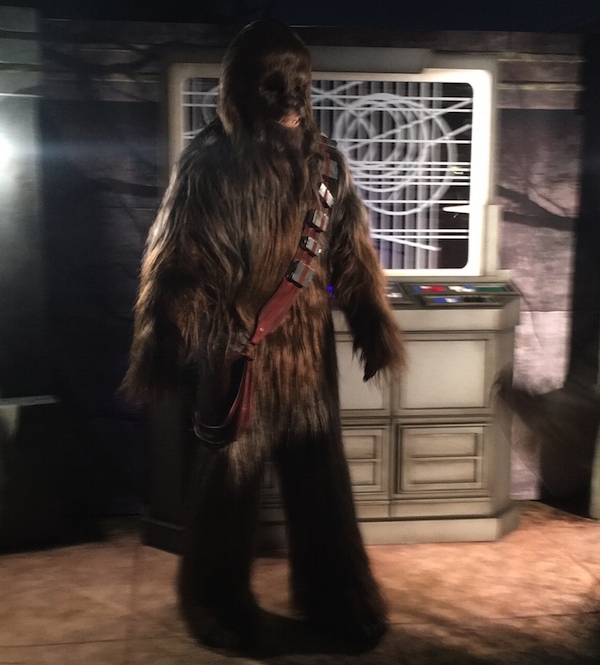 Chewbacca was giving out hugs on the course for the second day in a row. People were so happy to see him! Who wouldn't be? He's the best! Chewbacca is giving out hugs again! Once again we passed by it's a small world and I stopped for a photo. So beautiful! Why can't it be Christmas all the time?! Next we ran through Frontierland where I waited a long time for this photo with fellow Rebels Sabine and Ezra from Star Wars Rebels. Totally worth the wait because we're on the same team. On the way out of Disneyland I stopped to blow kisses to these two grumpy guys. They were not impressed. I came out of Disneyland, crossed the Esplanade and entered Disney California Adventure. I heard from Emelia who was standing somewhere in this line for BB-8. It's hard to tell because taking a panoramic photo while people are running doesn't really work, but the line spans from the left side of the screen all the way to the right side. It's long! I walked right on by and started to get a little bit nervous when it seemed like mile 4 was kicking us out onto Harbor. Thankfully I was wrong and instead we weaved right back into California Adventure via Cars Land. I loved that this course kept us in the park. We then turned towards Paradise Pier where there were Stormtroopers directing traffic. I stopped for a photo at my favorite photo spot in the park. I love taking photos of my family here! I wrapped up the last bit of miles by walking as fast as I could to make up for the times I slowed down. The finish line was soon in my sight and was so happy to be feeling SO great! I did it! I walked. I had fun. I took a few photos. I stopped for one character photo. I didn't hurt myself and I wasn't in pain. This was a huge win for my confidence going into full recovery from this injury. My pace was nothing to write home about, but considering I walked and still took a few photos, I was happy. I love my new Garmin! I left the race area as quickly as possible because I needed to stop by Steakhouse 55 to cancel my late breakfast reservation. I was actually really hoping they would seat me right then, but didn't think it would be possible. Sure enough, they seated me immediately. I was so thankful because I didn't think it was possible to walk back to my hotel on Harbor, shower, get ready and be back by my reservation time. I was grateful for the amazing customer service & delicious food. I made sure to speak to the manager on my way out to thank her and the Cast Members for taking care of me. 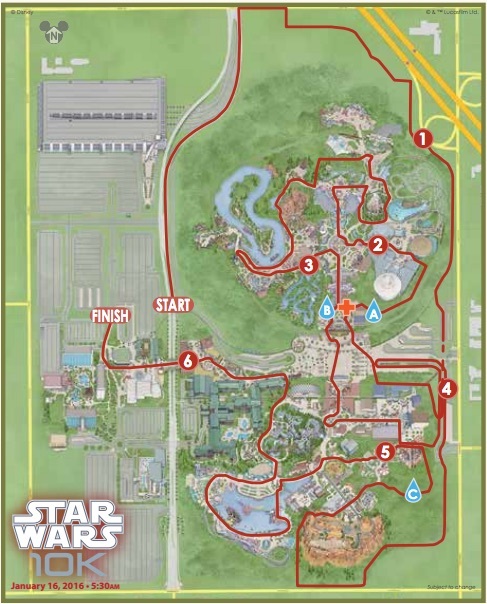 Just like last year, I loved the Star Wars 10K and plan to keep running this race for as long as I am physically able! I love the shirt and medal, the course, the crowd and weather in Anaheim this time of year. All PROS no CONS. Wait, I take that back. The price of the races is pretty high considering the cost of the photos equals another race bib. I really wish the photos were in included in the price at this point. Stay tuned for part 2 of my Rebel Challenge recap and please share your recaps in the comments below!